Is there anything quite like a chocolate chip cookie to make you smile and even feel like a child again? I think not. Lucky for us, Santa brought me a few cookbooks–one of which is Danielle Walker’s Against All Grain, made famous by her blog of the same name. I have been a fan of hers for a while and made several recipes from her blog–the best of which was the grain-free, paleo bread. Danielle was diagnosed with ulcerative colitis in 2007 and eventually came to learn that she could rebuild her system, and avoid pain and suffering, by eating the right foods and eliminating the wrong foods. Determined to once again enjoy the foods she loved, she dedicated herself to recreating those dishes. Crackers, porridge, chowders, rice, sandwiches, burgers and even doughnuts, her cookbook is filled with more than 150 gluten-free, grain-free, dairy-free recipes that rock. Really. Her hard work and persistence has paid off with her successful blog and now this New York Times best-selling cookbook. Great recipes and great photographs are one thing, but this book is also well thought out and well-written. I practically read it like a book. One guess at what classic sweet treat she revamped that was on the top of my list to make? Chocolate chip cookies. The last chocolate chip cookie I had was more than two years ago when I made ice cream sandwiches for my birthday in July 2011. Looking back, even though the recipe was paleo, there is definitely too much sugar. One and a half cups of semi-sweet chocolate chips and 1/2 cup of honey? Yikes. That’s a lot. So what I love most about this rendition is that it is basically 1/4 cup of the following ingredients–palm shortening, coconut sugar, dairy-free chocolate chips and dark chocolate, along with almond flour and a sprinkle of coconut flour. 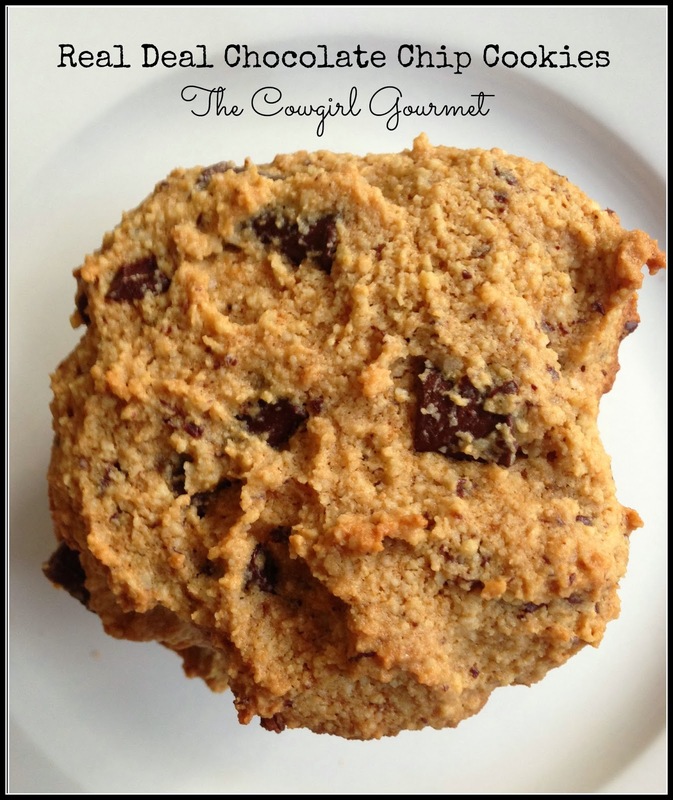 Add a few other household pantry items and minutes later you will be biting into a healthy chocolate chip cookie. These cookies are so good, I am betting that even the most persnickety chocolate chip cookie lover will fall for this adaptation. And since we’re all contemplating new year’s resolutions, I think now is an ideal time to make these cookies. Wishing you and your family a bright, healthy and fantastic 2014. If you like chocolate chip cookies like I like chocolate chip cookies, then get ready to enjoy the first good for you and good tasting chocolate chip cookie ever. Not too sweet, this cookie is just right. The bonus? They are super easy to make. Place the shortening/butter, egg, coconut sugar, honey, egg and vanilla in the food processor for about 15 seconds or until smooth and fluffy. Add the almond and coconut flour, baking soda and salt and mix again until combined, about 30 seconds. If needed, scrape down the sides of the bowl to blend everything together. Pulse another time or two. Stir in the chocolate chips and chocolate by hand. Place balls bigger than a quarter in radius on a silpat or parchment paper lined baking sheet. Using a spatula, knife or your hand, smoosh the cookie so its flat as these cookies will not spread very much when you bake them. Bake for 10-15 minutes, until golden brown around the edges. Remove from the oven and let rest on the cookie sheet for 5 minutes. Place on a wire rack and let cool. They are best served warm, so eat immediately. If any remain, simply refrigerate and eat soon.